More audio editors are giving the Reaper editing app a spin. There’s a good reason, too. The digital audio workstation (DAW) has a lot of value: it blends an inexpensive price tag with powerful customization. All you need is a fairly modern computer and a basic audio interface and you can cut audio like a pro. That customization comes with a cost, though. The app can be a bit intimidating to use at first. The app options are endless. Today’s post is designed to help. 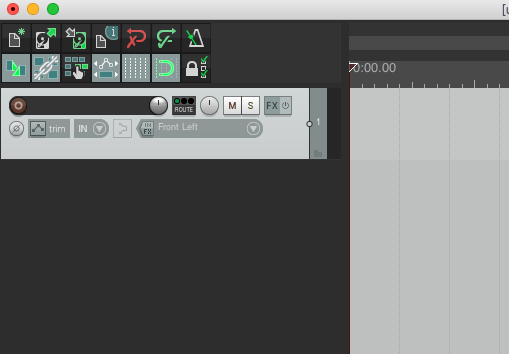 It includes quick tips to get you up and running and cutting sound with Reaper quickly. This article will guide you through creating a project, learning its layout, adding and editing audio, and exporting your finished work. Let’s get to know Reaper before we start working. When you first launch Reaper you will be shown the “Choose Project(s)” window. It will the option to open an existing project, create a new one, or choose from past projects. Let’s choose New project. There’s a lot going on in this window. We’ll start with the basics, first. On the left is the list of tracks, known as the Track Control Panel (TCP). At center-right is the editing window. In the center, running horizontally is the transport panel, and beneath that is the mix panel. At the moment, things look pretty empty right. We’ll change that soon. Before we get rolling, we need to set up your audio device so you can receive and output audio. 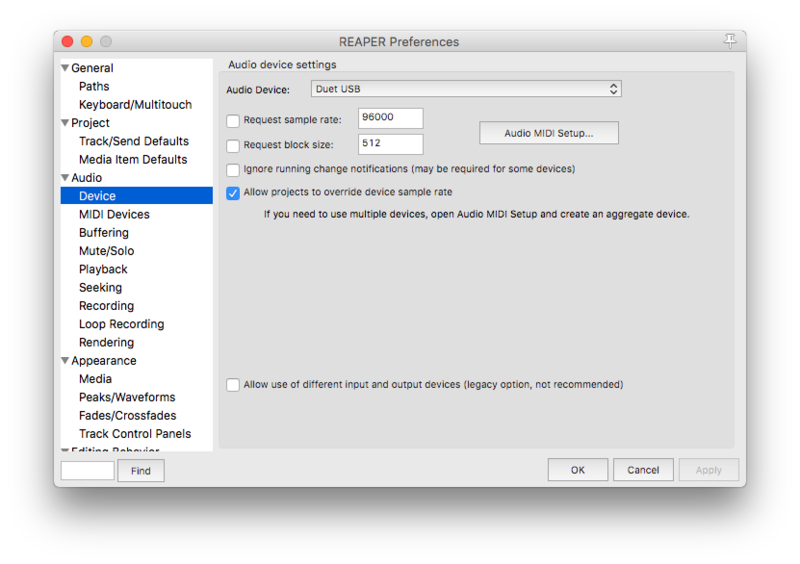 Select the Reaper>Preferences… menu item. In the following window select “Device” from the “Audio” section. Select your preferred audio device from the drop-down menu at the top, then click the “Apply” button. Command + Click Mute or Solo: reset button. Option + Click Mute: mute all other tracks (inverted mute). Right-Click on Mute or Solo to see other options. The red, round button to the upper left is the record arm/disarm button. You can name the track by double-clicking the dark grey area on the upper left of each track. The dial to the right of this changes the volume, which can also be done in the with the fader in the mix panel, below. Let’s add some audio. Reaper calls these “media items.” There are a few ways to do this. 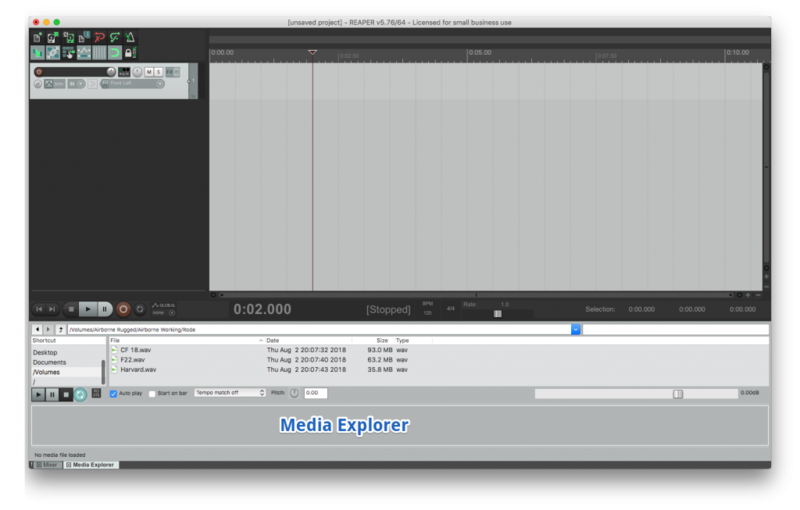 The first option is to simply drag and drop sound clips into the editing window. A longer but more comprehensive way is to add clips via Media Explorer. Open the media explorer by selecting the View>Media Explorer menu item or by typing Command + Option + X. This will display a new window at the bottom of the screen. From here you can browse through folders or find sounds by keyword search. Any clips you find can be previewed in the waveform display. When you find one you like, drag and drop clip sections or entire sounds from the Media Explorer into the editing window. You can also add them by double-clicking. New audio can also be added by recording directly into a track. Simply click a track’s record arm button. When you are ready to go, click the record button in the transport bar (command-r) and audio will be written to the track. To hear what you’ve added, press the Spacebar. Play a selection repeatedly in a loop by pressing R, and then the spacebar. Pressing R again turns off loop playback. Don’t like the clips you’ve added? Simply select it and press the Delete key. Once you’ve worked for a while, you’ll find that your edit window is filling clips. How do move around the tracks and audio in the edit window? Zoom in horizontally: =/+ key or scroll wheel down. Zoom out horizontally: -/_ key or scroll wheel up. Zoom to time selection: Command-Page Up. Move the timeline left: Shift-Scroll Wheel Left or Shift-Scroll Wheel Up. Move the timeline right: Shift-Scroll Wheel Right or Shift-Scroll Wheel Down. Collapse track size: Page Down Key or Command-Scroll Wheel Up. Expand track size: Page Up Key or Command-Scroll Wheel Down. Now you have a few clips in the window. Let’s try editing them. As you’d expect, clicking and dragging a clip left and right moves it earlier or later in the timeline. Dragging it up and down moves it from one track to another. To trim a clip, hover on its edge. The mouse icon will switch to a trimmer icon. Drag to shorten the clip. You can also trim a clip to a timeline selection. Simply select a span of time in the timeline, then choose the Item/Trim items to selected area. Want to divide a clip in two? Place the cursor in the middle of a clip and press the S key. You can also split a span of audio. You can select a span of audio by dragging across the edit window, or across the timeline at the top of the edit window. 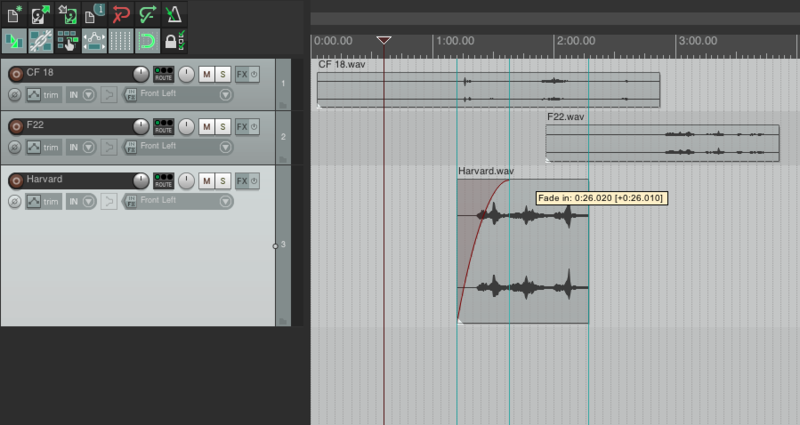 Type Shift-S to cut the audio at the beginning and end of the span of the selected tracks. Let’s try adding fades. Hover the mouse pointer on the upper corner of the clip. The icon will change to a fade icon. Click, hold, and drag to create a fade. Adjust a fade by clicking and dragging on the fade slope. Remove the fade by dragging it all the way back to the edge. You can see different fade shapes by right-clicking on the fade, then clicking on one to apply it. Crossfade two clips by dragging one clip over another (that is, provided that auto-crossfade is turned on (Option-X)). Another method: select a span across and edit, double-click the track, and press x. Change crossfades using the same idea as regular fades: just hover the mouse, click, hold, and drag to change the fade shape. Hold Shift while dragging to move the crossfade left or right in place. Like many other apps, Reaper lets you copy and paste. Just select a clip, type Command-C to copy it, Command-X to copy and remove it, and Command-V to paste it. Use Command-Shift-C to copy or Command-Shift-X to copy and remove or from a time selection instead. Made a mistake? No problem. Similarly to other apps, Command-Z reverts the previous action and Command-Shift-Z restores it. Finished editing your masterpiece? It’s time to get it out of your project and share it with the world. 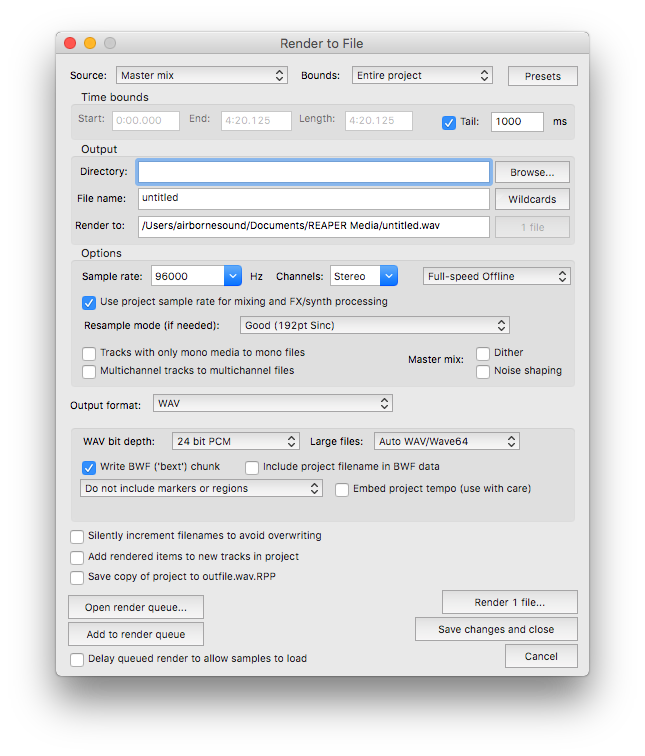 Export your work by choosing the File/Render… menu item. A new window will appear that allows you to choose the source, the time span, the output directory, name, destination rate and more. Once you’re ready, click the “Render x file(s)…” at the bottom right and your track will save to the chosen directory on your hard drive. It’s not easy learning any audio editing app. It makes sense; cutting sound is a complex task. Every app has its standards and styles. It takes time to master them all. 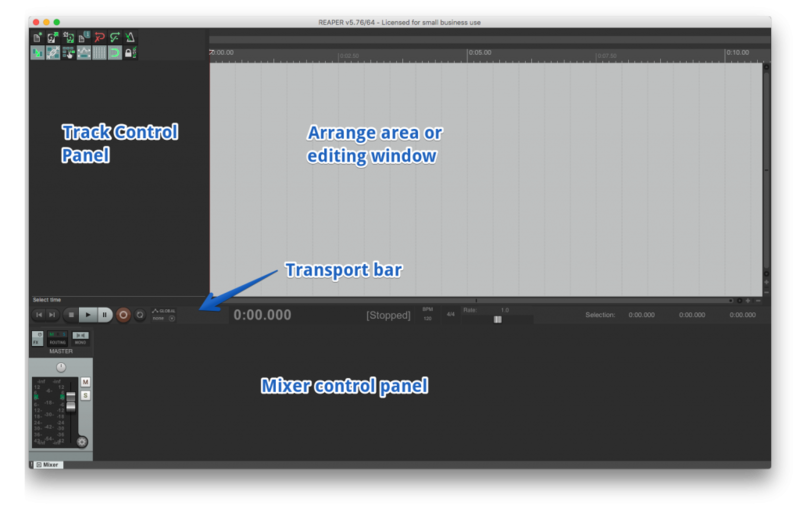 Use the steps in this post to get a good grip on editing with Reaper. Soon you’ll be using Reaper’s power to create impressive soundscapes. Below is a recap of the keyboard shortcuts from this blog, as well as the names of the shortcuts if you wish to find and change them to your liking inside of the Reaper action manager window.